Home » Blog » Should We Be Worried About Radiation from Fukushima? 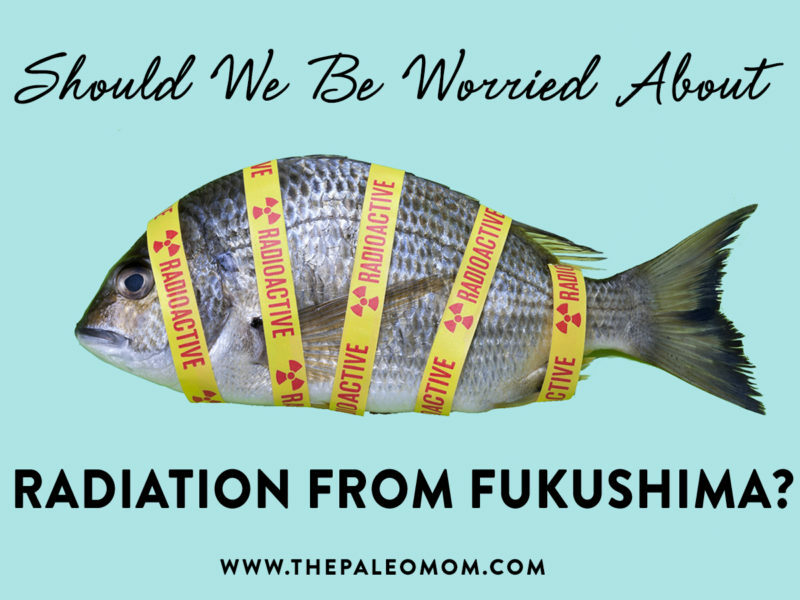 Radioactive fish, toxic seaweed, contaminated oceans… if you’re worried about radiation from Fukushima invading your food and harming your health, you’re not alone! Years after the famous 2011 power plant disaster caused by a tsunami, the internet is still abuzz with articles warning that Fukushima radiation is leaking into the water and contaminating our aquatic food supply, and that our days of eating Pacific seafood are over. 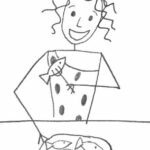 On one hand, some official sources (like the FDA) have assured us there’s no safety hazard in consuming fish (and that any detectable radiation in seafood is at levels well below the danger zone). 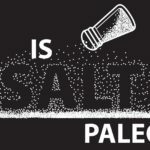 But maybe you’ve seen headlines like “28 Signs That The West Coast Is Being Absolutely Fried With Nuclear Radiation From Fukushima” (Global Research) “We’re Eating Fukushima Radiation; Bloody Cancerous Tumors in Fish & Seafood” (from davidwolfe.com) and aren’t sure what to believe. 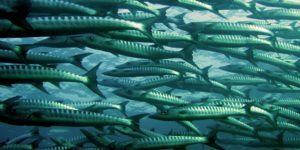 Should we keep fish and seaweed on the menu, or should we nix the bounty of the sea due to legitimate radiation concerns? 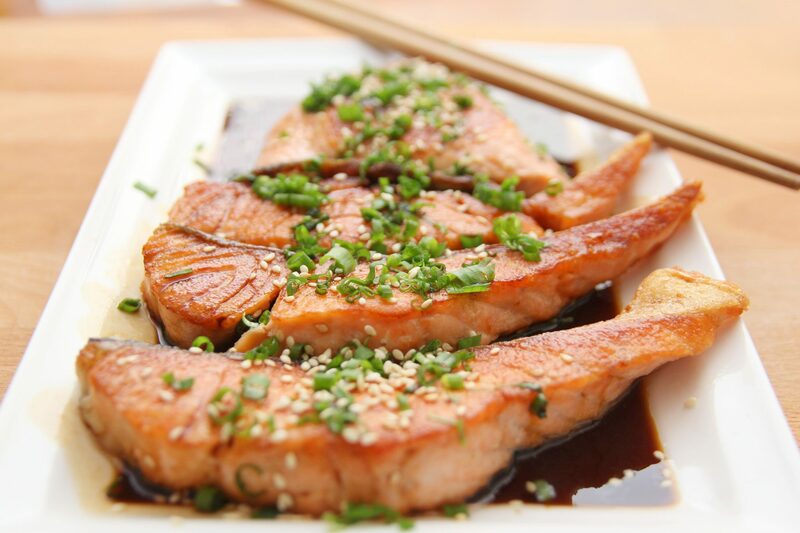 Before you swear off salmon (and all of its omega-3 goodness!) forever, let’s take a look at the science! Just by being alive on planet earth, we’re exposed to low levels of ionizing radiation on a daily basis. Some of it occurs naturally (cosmic rays from outer space, radioactive materials in the soil, radioactive elements in air and water, and even a percentage of the potassium in our food and in our own bodies that is in the form of potassium-40! ), and some of it is from human activity (like x-rays, smoke detectors, and the leftover effects of atomic testing from decades ago). The types of radionuclides we’re exposed to are diverse, ranging from hydrogen-3 and beryllium-7 from outer space, to primordial radionuclides (which were present when the earth was first formed) like potassium-40 and rubidium-87. The most commonly studied “signature” radioactive isotopes for nuclear power plant-related radiation are iodine-131, cesium-134, and cesium-137, which are byproducts of the fission reactions that produce nuclear energy. A single exposure of 10,000 millisieverts is enough to cause death from acute radiation sickness. 2,000 millisieverts can cause severe radiation poisoning. 100 millisieverts is the lowest yearly dose that’s been linked to an increased risk of cancer. 50 millisieverts is the maximum allowable occupational dose per year for workers in the USA. So, from those figures, we can tell right away that a small increase above our normal radiation exposure (again, about 6.2 millisieverts per year) is unlikely to cause any detectable problems for our health. Doubling, tripling, or even quadrupling the average annual exposure would still leave us well under the levels radiation workers are allowed to receive on the job! And that level is still only half of what has been verified to statistically raise cancer risk. So, where does radioactive seafood fit into the picture? How much radiation could we realistically receive from eating fish contaminated with radiation from Fukushima? Could it push us into the danger zone? Here’s where it gets interesting, and where we can start to see why alarmist news outlets have it all wrong! Per the MAFF, fish species with cesium levels exceeding the upper safety limits (which, so far, are primarily bottom-dwelling species) are prohibited from being fished in the area (meaning you don’t have to worry about accidentally ordering a high-radiation Fukushima fish off a restaurant menu!). And, cesium is rapidly lost from the muscle tissue of fish once they leave contaminated waters, so any creatures swimming away from the disaster zone are going to reach US shores with dramatically lower (read: safer!) levels of cesium than they started with (which scientists have documented with contaminated tuna that migrate from Japan to the coast of California). Likewise, on the US side, the FDA follows Import Alert #99-33, which mandates that food shipments from Japan be detained if the food is at risk of radioactive contamination. And, several independent testing agencies have been hard at work monitoring Fukushima radiation levels in the ocean and in the food supply, such as Our Radioactive Ocean and Berkeley’s Kelp Watch (which ended in 2016 due to not finding evidence that Fukushima radiation had reached seaweed on the West Coast). And, if that’s not reassuring enough, studies have been conducted on human exposure to Fukushima radionuclides that comes specifically from ingesting seafood, and also found no reason to be worried. One 2015 paper looked at the effective dose commitment from eating Pacific fish, shellfish, and seaweed (the effective dose commitment is a calculation of radiation exposure spanning 50 years from the initial ingestion, since radionuclides that get incorporated into our tissue give us not only an initial exposure, but also ongoing exposure for isotopes with a long half-life). The paper found that the individual effective dose commitment from eating contaminated fish from the Pacific Ocean was 0.07 millisieverts per year, which is much lower than the radiation exposure we receive from eating naturally-occurring radioactive potassium-210 in fish and shellfish (which is about 0.7 millisieverts per year—10 times higher!). Even when measuring contaminated fish, shellfish, and seaweed caught from coastal waters within 20 km of Fukushima itself, the total effective dose commitment was only estimated to be 0.6 millisieverts per year, still a bit lower than the radiation from potassium-210 in seafood (and nowhere near enough to significantly raise the risk of radiation-related cancer). 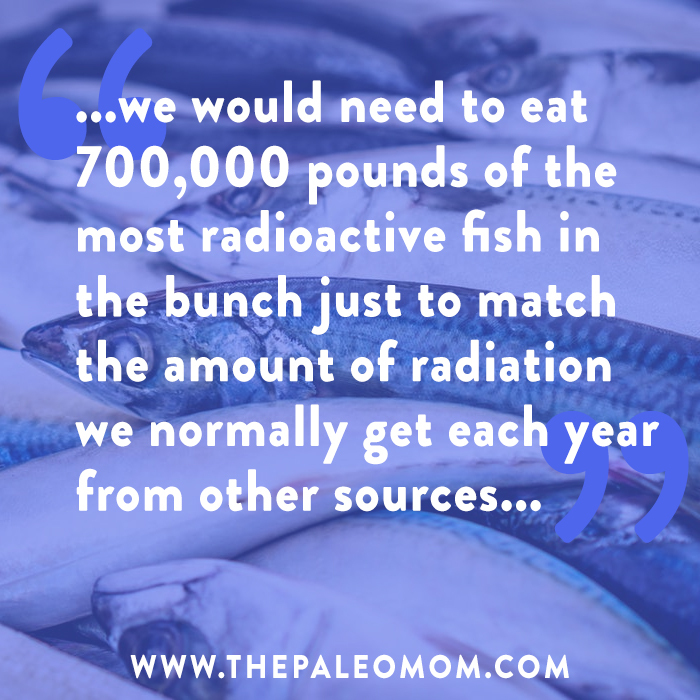 And, these were probably over-estimates: the researchers noted that much of the radionuclide content of fish doesn’t even make it into our mouths, because only about 50% of each fish is consumed (the rest being bones and other inedible bits), and additional losses occur when radionuclides are transferred to liquid or cooking oil, which we then discard. Let’s think about these numbers for a minute. Even if we went hog wild on fish and managed to triple the maximum exposure estimate from Fukushima-area seafood, on top of the average radiation we get from other sources, we’d still only be at 1/12th of the very lowest radiation exposure linked to cancer. This means that even the biggest sushi lover could not possibly eat their way to a radiation intake high enough to cause damage! So why do we keep seeing scary articles about Pacific seafood being dangerously radioactive? Part of the reason non-alarming Fukushima findings turn into doom and gloom messages from the media is a lack of understanding about radiation terminology and what levels are actually harmful. 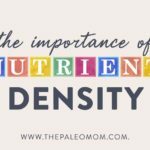 Because units of measurement for radiation (millisieverts, microsieverts, sieverts, becquerels, and rem… among others!) aren’t familiar words to most of us, it’s much harder to mentally put them into context than if we were using, say, inches or pounds or ounces. So, when we see a headline proclaiming that radiation was detected in fish in the US food supply, the fine print is that the levels are hundreds of times lower than anything that could hurt our health (a reputable news site will state this, but the ones that rely on click-bate titles and scaremongering won’t!). For example, the December 2016 discovery that Fukushima radiation was detected in West Coast fish (leading to articles like “Radioactive fish from Fukushima nuclear plant found on west coast of US” from Natural News) really only found trace amounts of radioactive cesium—1000 times lower than what’s considered potentially dangerous. And earlier, when tuna caught off US shores was found to contain radionuclides from Fukushima (another alarmist headline from Natural News that made the rounds on Facebook: “ALL bluefin tuna caught off West Coast are radioactive”), the truth was that those radiation levels were so low that we would need to eat 700,000 pounds of the most radioactive fish in the bunch just to match the amount of radiation we normally get each year from other sources (which, as we’ve seen, would still not be enough to significantly increase our cancer risk!). What’s more, despite fears that our oceans are the most dangerous source of radiation-exposed food, marine foods generally deliver much lower levels of radioactive cesium than terrestrial foods from equally contaminated environments. Scientists calculate that if an aquatic environment and land environment both receive the same level of cesium-137 contamination (per unit area), the amount of cesium-137 we ingest through seafood would be two orders of magnitude less than what we’d get through land-based foods (meaning only a percent of two of the amount we’d get from land-based foods). So, if we’re going to be worried at all, it’s the land-based agricultural exports from Japan that would be more likely to have higher radionuclide levels than fish, even taking into account any ongoing radioactive leaks into the ocean! Speaking of, just how bad are those ongoing leaks? While there is indeed evidence that the site of the disaster is still a source of radionuclides entering the environment, the release is nowhere near what it was during the initial 2011 catastrophe (in fact, the rate of release has dropped so much that it would take 5,000 years before the ongoing leaks would produce the same quantity of cesium that entered the ocean in the month following the initial accident, according to WHOI scientist Ken Buesseler). So, we currently have nothing to fear about ongoing leaks suddenly spiking the radiation in our seafood supply to dangerous levels! Throughout this post, we’ve seen references to naturally occurring radioactive potassium in certain foods and in our bodies, but it’s worth digging into this topic a little deeper. For one, because the idea of even “natural” radiation in food can seem scary (and might raise questions about whether we should moderate our intake of such foods, even when they’re otherwise Paleo-friendly), and two, because some discussions of Fukushima radiation assume that radioactive potassium can be used interchangeably with cesium to assess health risks (which isn’t quite true!). 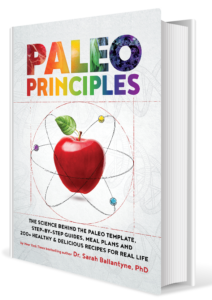 First, let’s talk about naturally-occurring radiation exposure from our diet. Did you know that all bananas are radioactive?! It’s true! Potassium-40 occurs naturally in bananas, as well as other potassium-rich foods like avocados, spinach, and mushrooms. In fact, trucks full of bananas have been known to set off alarms at radiation portal monitors due to the ionizing radiation they collectively emit! The potassium-40 issue has led to the occasional myth that we can get radiation poisoning from eating too many bananas (or other foods with potassium-40). 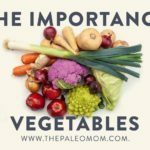 Luckily for banana lovers (and those of us who love nutrient-dense, potassium-rich fruits and vegetables—see “The Importance of Vegetables”), this is totally false! Potassium-40 is a special case when it comes to radiation, because we’re literally born with some of it in our tissue, and our bodies are able to maintain homeostasis by simply excreting our existing potassium-40 when we ingest it from other sources. So, the radioactive potassium from food isn’t cumulative in the same way other radioactive isotopes are, and the effects of extra radiation from bananas and other potassium-40-containing foods only lasts a few hours after we eat—basically, the amount of time it takes for our kidneys to restore our potassium balance and excrete any extra. Maybe if we ate several million bananas all at once, we could get a radiation dose high enough to cause radiation poisoning, but at that point we’d have bigger problems to worry about (such as the worst stomach ache ever). In fact, the potassium-40 in bananas is so well known that it’s given rise to something called “Banana Equivalent Dose,” where different types of radiation exposure are put in context by comparing them to how many bananas would yield an equivalent dose of radioactive isotopes. If you’ve been browsing through other articles discussing Fukushima radiation, you may have seen the Banana Equivalent Dose used to justify why we shouldn’t be concerned about the radiation levels in seafood. However, this type of comparison is somewhat misleading because of how our bodies handle different types of radioactive isotopes. Whereas we can easily regulate our potassium levels (assuming our kidneys are healthy! ), we don’t have a similarly efficient mechanism for regulating nuclear fission byproducts like cesium-137 and iodine-131. These can build up to acutely high doses if our exposure is extreme. So, for the sake of accuracy, we probably shouldn’t refer to the Banana Equivalent Dose when dispelling fears about Fukushima radiation. There’s plenty of evidence from other sources (which we’ve discussed in this post!) showing that we have no reason to worry without needing to use scientifically questionable arguments! As the months and years roll on, no doubt there’ll be articles popping up (especially on our social media feeds!) spreading more information about Fukushima radiation, much of which will be misleading. In order to know what to believe, the most important thing to check for is whether the article cites any peer-reviewed studies and whether it adequately puts radiation measurements into context. Many news sites rely on scary headlines and extreme claims in order to gain traffic and incite fear. When it comes to a food source that’s as valuable as seafood (see The Importance of Fish in Our Diets, Oysters, Clams, and Mussels, Oh My! Nutrition Powerhouses or Toxic Danger? 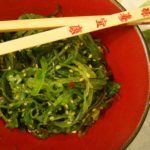 and Why Seaweed is Amazing! 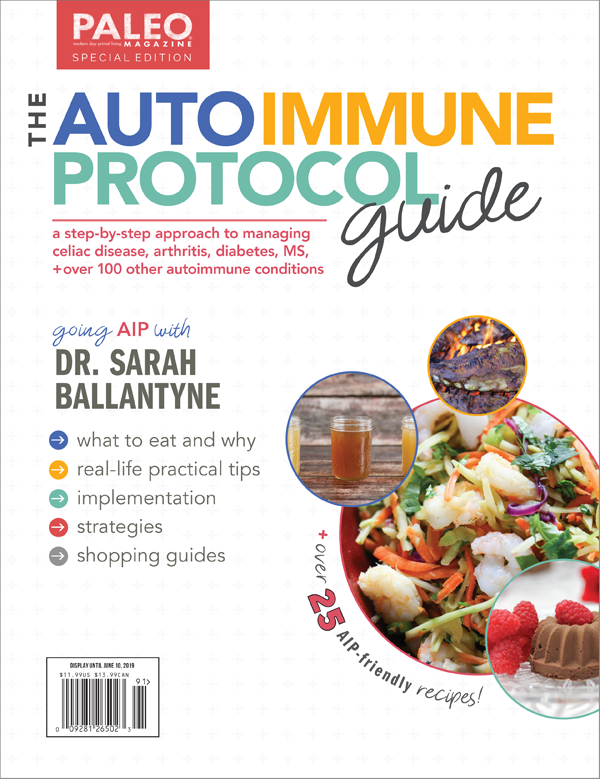 ), we need to be careful that any reasons for reducing our intake are truly based on science and not just based on hype! In short, there’s absolutely no evidence that we should avoid seafood due to radiation contamination (at least not seafood that’s legal to sell and purchase! ), and news stories that claim otherwise need to be examined with a critical eye. Brooks AL, et al. “Very Large Amounts of Radiation are Required to Produce Cancer.” Dose Response. 2007;5(4):263-274. Buesseler K. “Fishing for Answers off Fukushima.” Science. 26 Oct 2012;338(6106):480-482. Fisher NS, et al. “Evaluation of radiation doses and associated risk from the Fukushima nuclear accident to marine biota and human consumers of seafood.” PNAS. 2013;110(26):10670-10675. Gilbert ES. “Ionizing Radiation and Cancer Risks: What Have We Learned From Epidemiology?” Int J Radiat Biol. 2009 Jun;85(6):467-482. Madigan DJ, et al. “Pacific bluefin tuna transport Fukushima-derived radionuclides from Japan to California.” PNAS. 2012;109(24):9483-9486. Provinec P & Hirose K. “Fukushima radionuclides in the NW Pacific, and assessment of doses for Japanese and world population from ingestion of seafood.” Sci Rep. 2015;5:9016. 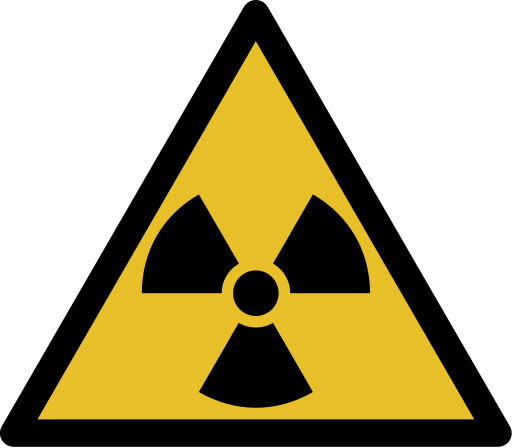 “Sources of Radiation: Man-Made Sources.” United States Nuclear Regulatory Commission. October 2014. Accessed November 30, 2015. “Sources of Radiation: Natural Background Sources.” United States Nuclear Regulatory Commission. October 2014. Accessed November 30, 2015. Wahl LE. 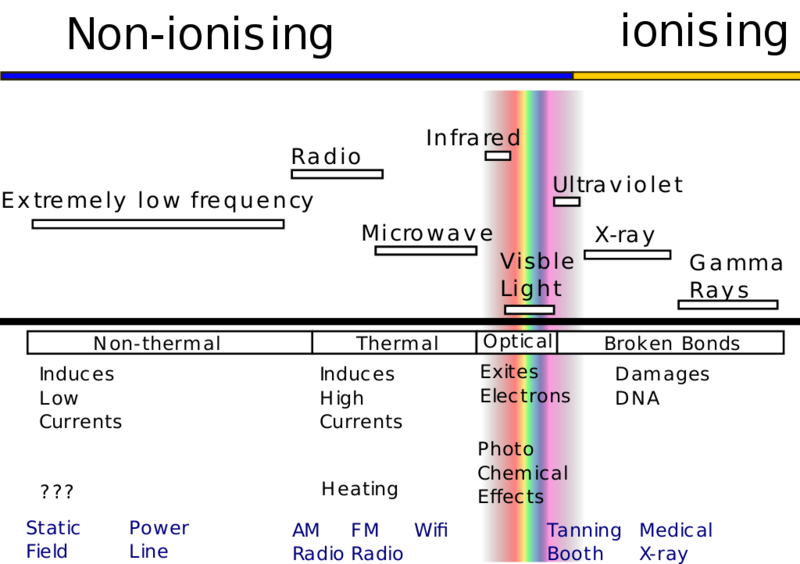 “Environmental Radiation Fact Sheet.” Health Physics Society: Specialists in Radiation Safety. January 2010. Accessed December 1, 2015. 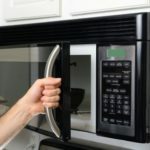 Are Microwaves Safe to Use? Thank you so much, salmon is my favorite seafood and I have been avoiding it and other Pacific foods for this reason for a few years now. Still eating wild caught sardines and anchovies from of the English/Scottish shores and some local caught wild fish from southern eastern Australian coastal waters and Newzealand. You have encouraged me to investigate further as I adore Atlantic Salmon the most. This is a great article. Very well put and well researched. 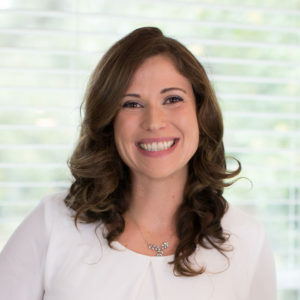 I am passionate about nutrition, natural foods, and the environment/conservation, and I wish more people in our natural health community knew how the oil and gas industry and other special interests try to scare people away from the most natural (and cleanest) forms of energy. The sun is a nuclear reactor and nature is radioactive! We need to get off coal and natural gas ASAP. Of course, just like anything there are safe levels and unsafe levels of radiation just like you said (a natural supplement might be good for you in small doses but bad in large doses!) but I am excited for the time when everyone in the natural health community fights against these special interests for the truth. Brilliant job of covering this topic! Thank you for being a voice of sanity in a sea of panic. No mention of Strontium in this article. I understand this is the most lethal of isotopes, that mimics DNA in our bodies. I’ve read one study from 2015 that rates strontium-90 as the third most important radioisotope behind Cs-134 and Cs-137. That study found that strontium in fish with radioactive caesium was indistinguishable from background strontium levels. Basically no strontium from Fukushima. I’m not even should how a radioactive isotope can mimic DNA. Doesn’t seem possible. Completely different things. Good article, except fix the “potassium-210” error. There’s no such thing and I don’t know what you were thinking of. This. I was about to comment this as well. There’s no polonium-210 in any good way, so I suspect she’s talking about potassium-40. Another part of the reason is that so-called “Environmental” NGOs are not working for the public good as they would have you believe. They are working for their donors, who are, in large part, fossil fuel companies. If they can shut down clean, affordable, plentiful nuclear power, then they expand their market share for electricity generation by CO2 and PM10 spewing natural gas. Organizations like Sierra Club and Greenpeace pay their operatives to write and distribute these inaccurate, inflamatory stories about nuclear power. When questioned by climate change guru James Hansen, why they don’t get behind nuclear power as the cleanest, most affordable solution to CO2 emissions, representatives from one of the largest environmental groups stated that if they did all their funding would dry up.